This private city tour is designed for your small group or party and can be custom made or combined with other main attractions. 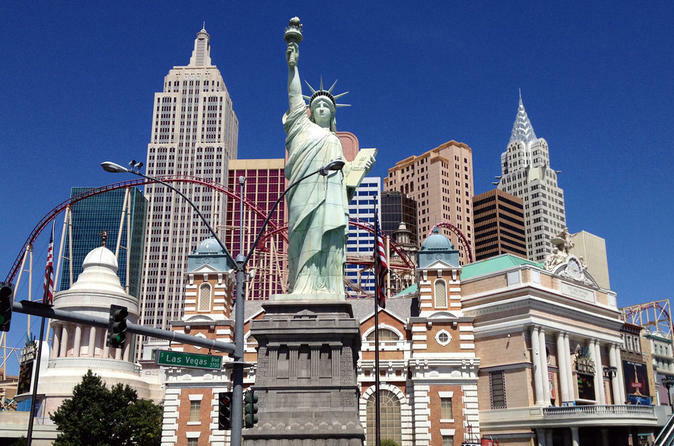 Tour and explore Las Vegas on this 4-hour private tour. After pickup from your Las Vegas hotel, you'll be taken to the famous "Welcome to Las Vegas" sign for a photo opportunity. From there you will take a leisurely ride down Las Vegas Boulevard where you'll listen to expert commentary and learn the history about Las Vegas. As you make your way to the north end of The Strip you'll make a visit to Downtown Las Vegas and Fremont Experience to see where it all began. If you have other points of interest that you would like to see you, please advise at the time of booking so your guide can incorporate it into your itinerary. Tours are available for groups of 14-, 24- or 27-passengers. Pricing is based per group, please book for one (1) passenger and select the passenger option at the time of booking.